Attracting over 320 entries on the day, many visiting from other regions including Longford and Sligo, it was a busy day for all involved with jumping continuing well into the early evening. In Arena 1 the morning belonged to the 148 athletes. Nearly, 100 entries went through the Tommy French Arena. Starting off the day was the 148 90cms, 14 combinations made it through to the Colm Quinn designed track without fault to share the prize fund on the day. In one of the bigger classes in the 148 category, 30 combinations took on the course in the 148 1m, however, the addition of a ‘double of verticals’ in the second phase saw many riders end with four faults, leaving 11 combinations to celebrate their double clear success. The 148 1.10m, went to the wire with an all-female line-up on the cards. However, onboard ‘Free Lily’ John McEntee ensured that the boys were in the line up also, slipping ahead of Niamh McEvoy and ‘Sparkling Boomerangs Clover’ to take the win at the last minute. Completing the 148 line up was the 148 1.20m. In a class that saw many thrills and spills. The leaderboard changed on numerous occasions, keeping those spectating enthralled in the jumping. Leading the field was Niamh McEvoy, this time with her beautiful dun mare ‘Milchem She’s A Keeper’, with a time of 30.08. Many tried but failed to overtake this talented young rider, that was until the last rider, fellow TRI Ambassador Alex Finney, who threw caution to the wind with Dirraw Caleb stopping the clock in 29.69. Staying in Arena 1, the afternoon belonged to the 138 competitions. In the 138 80cms, three riders were able to record double clears on the day and walk away with some prize money as well as TRI Equestrian vouchers for use on the onsite TRI Superstore. The 138 90cms saw nine combinations complete the course without fault to take a share in prizemoney and TRI Vouchers once more. Jenny Dunlop was in dominant form in the 138 1m and 1.10m, claiming victory in both the classes with ‘Rockin Roxie’. Hovering around the 30 second barrier, Dunlop was unstoppable, with many challengers during the competitions giving chase. Over in Arena 2, 128 athletes from all over the region ensured jumping continued well into the evening. Starting off the morning, the youngest of riders took to the arena in the 128 50cms of the 11 starters. Four completed the two phases without fault, letting them walk away on the day laden with TRI vouchers and Easter eggs. Easter Eggs galore was the theme of the 128 60cms with 13 combinations receiving prizes. The 128 70cms saw 26 combinations coming to Meadows. The course design team at the Meadows set a flowing course for these young riders, resulting in double clears from 17 combinations. It was more of the same with the 128 80cms with athletes proving to be too talented for the efforts of the course design team. In one of the fastest classes of the day, the 128 85cms under 10 was a class all of its own. 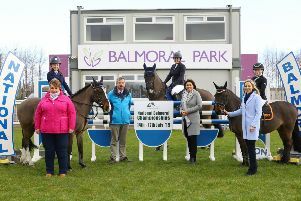 With the added pressure of being a qualifier for RUAS Balmoral Show in May, nine combinations made it through to the jump off, the red rosette in the day went to Malin Head athlete Sarah McLaughlin who set a blistering time of 32.78. Closest to McLaughlin’s time was Zoe Caskey with Ruthstown Speed, who finished in 33.68. Peter Morton had a very successful day when taking 2nd place in the 128 90cms and winning the 1m classes with his mother Joanne’s ‘Tynan Tuttle Pip’. Following the 128 classes, it was the turn of the Children on Horses & Juniors to take to the arena. The 1.10/1.20m handicap brought the day to an exciting close, with some of the region’s most talented athletes going head to head for the final rosettes of the evening. Winning the competition was Mathew Conlon with Bally Kingdom Clover in a faultless round over the Aaron McCusker designed course. Conlon stopped the clock in 42.55, ahead of Catherine Buchanan, who had a faster time but unfortunately one fence on the floor for four faults. 128 50cms Newcomers - Divided between Gabriel Tunney’s Horizon Star (Elsie Tunney), Victoria Clarke’s Quantum Persia (Chloe Clarke), Donna Millar’s Sir Bob (HPA) (Ruby Millar), Donna Millar’s Vales Little Bobbi (Ruby Millar). 128 60cms Newcomers - Divided between Martina Mccrory’s Aughmore Dante (Kaitlin McCrory), Jillian Nelson’s Casper (Ur) (Juliana Nelson), Orla Diamond’s Diamond’s Sunshine (Eenna Hamilton), Shirley Donnelly’s Freelance Fortuna (Robyn Donnelly ), Niki Taylor’s Goldengrove Fantasy (Medb Kinney), Hugh Treanor’s Laurtom Hot Pursuit (Kenny Treanor), Jillian Nelson’s Loughries Star (Juliana Nelson), Angela Maguire’s Manny (Lexie Maguire), Martina McCrory’s My Party Pop (Kaitlin McCrory), Victoria Clarke’s Quantum Persia (Chloe Clarke), Frances Mellett’s Sox Line Cassie (Zoe Mellett), Martin & Tracy Kelly’s Tuity Fruity (Eunan Kelly), Donna Millar’s Vales Little Bobbi (Kate Millar). 128 70cms - Divided between Martin & Tracy Kelly’s A Little Fairplay (Eunan Kelly), Liam Filan’s Carlton Ellgo (Billy Filan), Janet Currie’s Curolea Rosi (Rebecca Coulter), Breda McMunn’s Foxburrows Patrick KC (Cian McMunn), Briony Murphy’s Golden Grove Maurice (Darragh Murphy), Niki Taylor’s Goldengrove Fantasy (Medb Kinney), Sparkling Equine’s Lackaghmore Katie (Jessica Baxter), Angela Maguire’s Manny (Lexie Maguire), Martina Mccrory’s My Party Pop (Kaitlin McCrory), Ronan McLaughlin’s Rashers And Sausages (Sarah McLaughlin), Briony Murphy’s Rough Diamond (Darragh Murphy), Edward Walsh’s Saltre Commanchero (Helen Walsh), Donna Millar’s Sir Bob (HPA) (Kate Millar), Frances Mellett’s Sox Line Cassie (Zoe Mellett), Martin & Tracy Kelly’s Tuity Fruity (Eunan Kelly), Paul Hackett’s Woodtown Little Star (Oran Hackett). 128 80cms - Divided between Martin & Tracy Kelly’s A Little Fairplay (Eunan Kelly), Roisin Cathcart’s Ballymacooda Jack (Sophie Cathcart), Martin & Tracy Kelly’s Bright Bling (Caitlin Kelly), Liam Filan’s Carlton Ellgo (Billy Filan), Lisa Smith’s Knockmenagh Rocco (Lori Smith), Jenna Fitzpatrick Burns’s Lisnagades Limitededition (Johan Fitzpatrick Burns), Edward Walsh’s Little Orchard Melody (Helen Walsh), Niki Taylor’s Maximilo (Medb Kinney), Breda McMunn’s MoonFlower (C.H.A.P.S) (Cian McMunn), Lynn Caskey’s Ruthstown Speed (Zoe Caskey), Donna Millar’s Sir Bob (HPA) (Kate Millar), Janette Baxter’s Sparkling Class Act (Jessica Baxter), Jane C P Russell’s Super Sonic (Sarah Mclaughlin), Sparkling Equine’s Tabita Chantilly Lace (Jessica Baxter), Lisa Smith’s Top Spot (Lori Smith), Lisa Torrens’s Tyrrellspass Mademoiselle (Irl) (Cillian Torrens). 128 Under 10 85cms (Including RUAS U10 Qualifier) - 1, Jane C P Russell’s Super Sonic (Sarah Mclaughlin); 2, Lynn Caskey’s Ruthstown Speed (Zoe Caskey); 3, Edward Walsh’s Little Orchard Melody (Helen Walsh); 4, Martin & Tracy Kelly’s Bright Bling (Caitlin Kelly); 5, Breda McMunn’s MoonFlower (C.H.A.P.S) (Cian McMunn); 6, Niki Taylor’s Maximilo (Medb Kinney). 128 90cms - 1, Ronan Mclaughlin’s Linde Hoeve’s Ricardo (Jamie Clarke); 2, Joanne Morton’s Tynnan Tuttle Pip (Peter Morton); 3, Martin & Tracy Kelly’s Ballyglunin Girl (IHR) (Zara-Jane Kelly); 4, John Black’s Chocolat II (Erin Mathieson); 5, Martin & Tracy Kelly’s Newhaven Sophia (Zara-Jane Kelly); 6, Heffron Equine LTD’s Dandy (India Heffron). 128 1m - 1, Joanne Morton’s Tynnan Tuttle Pip (Peter Morton); 2, Pam Moore’s Leo the Lionheart II (Kym Moore); 3, Heffron Equine Ltd’s The Nut Cracker (India Heffron); 4, Victoria Clarke’s Its Only Money (Jamie Clarke); 5, Pam Moore’s Oaklea Supreme (Kym Moore); 6, Robert Fagan’s Millfield Duke (Alanna Fagan). 138 80cms - Divided between Beverley Mc Cullough’s Beechill Sue (Mya McCullough), Phelim Comey’s Dexters Lady (Caitlin Comey), Rachel Pearson’s Lackaghmore Frishow (Calum Pearson). 138 90cms - Divided between Robert Fagan’s BBS Woodies Blue Lagoon (Alanna Fagan), Beverley McCullough’s Beechill Sue (Mya McCullough), Paul Mc Cann’s Callens Lady (Lucy McCann), Colm Mcgrath’s Coomlogane Kojak (Kiera McGrath), Cavan Equestrian Centre Cavan Equestrian Centre’s Derek’s Clonbalt Lad (Camryn Clarke), Cali O’donnell’s Gaulstown Lady Bishop (Calum McVeigh), Briony Murphy’s Kreme (Darragh Murphy), Damien McPhillips’s Magical Millicent (Orla Cusack), James Mcevoy’s Super Sue (Ellen McEvoy). 138 1m - 1, Andrew Dunlop’s Rockin Roxie (Jenny Dunlop); 2, Sarah Doherty’s Springhill Copper Beech (Oliver Doherty); 3, Cali O’Donnell’s Knockagaron Fear Bui Falcon (Calum McVeigh); 4, Paul Mc Cann’s Callens Lady (Lucy McCann); 5, Cali O’Donnell’s Gaulstown Lady Bishop (Calum McVeigh); 6, Orla Harris’s Knockash Tonic (Conor Harris). 138 1.10m - 1, Andrew Dunlop’s Rockin Roxie (Jenny Dunlop); 2, Heffron Equine Ltd’s Double Trouble Boy (Alfie Adair); 3, Andrew Thompson’s Keogans Boy (Beth Thompson); 4, Marble Arch Equine Ltd c/o Bernard Conlon’s Glenford Clausa (CPBS) (Matthew Conlon); 5, Victoria Clarke’s Le Puy en Velay (Camryn Clarke); 6, Tara Flanagan’s Wirwick Ginger (Che Flanagan). 148 90cms - Divided between Tina Smith’s Cornatully Remo (Mairead Smith), Brendan Canavan’s Diamond II (Megan O’Neill), Owen Sharkey’s Fanad New Year (Caoimhian Sharkey), Cathal Forbes’s Gortlemon Isabelle (Emma Forbes), Sarah McLean’s Kiltiernan Bell (Katy McLean), Gerard McCann’s Lislaird Nancy (Ellie McCann), Heather Blair’s Moyans Dun Deal (Harrison Blair), Martin Mckenna’s OBS Good To Go (Conor Harris), Phelim Comey’s Princess Nora (Caitlin Comey), Cathal Forbes’s Rainbow’s Promise (Emma Forbes), Andrew Thompson’s Rakish Talisman (Beth Thompson), Gary Haughey’s Sahara Storm (Dolly) (Ava Haughey), Nicola Burns’s Tullymurry Sunshine (Zara Burns), Stacey Babes’s Wrenwood Bambilino (John McEntee). 148 1m - Divided between Sarah Doherty’s Attyrory Obos Girl (Sophie Doherty), Sharon Kelly-Murphy’s Clinton Class (Ellen Thompson), Niall Hughes’s Dun Boy (I.P.S.A) (Enya Hughes), Heather Blair’s Moyans Dun Deal (Harrison Blair), Martin McKenna’s OBS Good To Go (Conor Harris), Cathal Forbes’s Rainbow’s Promise (Emma Forbes), Catherine Maguire’s Simon Said (HSI) (Clara Maguire), Sparkling Equine’s Sparkling Lackaghmore Joey (Donal O’Connor), Sparkling Equine’s Sparkling Mr. Boom Top (Donal O’Connor), Owen Sharkey’s Woodside Lad (Caoimhian Sharkey), Stacey Babes’s Wrenwood Bambilino (John McEntee). 148 1.10m (inc 6/7 Year Old) - 1, Victoria Clarke’s Free Lily (John McEntee); 2, Sparkling Equine’s Sparkling Boomerang’s Clover (Niamh McEvoy); 3, Joanne Morton’s Tynan Whiskey River (Lucy Morton); 4, Victoria Gulliksen’s Milchem Shes A Keeper (Niamh McEvoy); 5, Tara Flanagan’s Thornfield Shadow (Kellie-Rose Flanagan); 6, Hugh Treanor’s Bay Star Lady (Shannon Treanor). 148 1.20m - 1, Jean Finney’s Dirraw Caleb (Alex Finney); 2, Victoria Gulliksen’s Milchem Shes A Keeper (Niamh McEvoy); 3, Jean Finney’s Corradino Du Bary (Alex Finney); 4, Deirdre Grant’s Saxton Freedam (Yiayan Evans); 5, Sparkling Equine’s Sparkling Boomerang’s Clover (Niamh McEvoy); 6, Andrew Thompson’s Trendy Blue (Ellen Thompson). Children On Horses & Juniors 1m - Divided between David Conlon’s Caltra Artic (Alfie Adair), Dean Bell’s Garryduff Diamond Mine (Ben Maybin), Jessica McIntyre’s Gregory Courage (Simone Leathem), Janet McDowell’s Thats Amore (Mya McDowell). Children On Horses & Juniors 1.10/1.20m - 1, Marble Arch Equine Ltd c/o Bernard Conlon’s Bally Kingdom Clover (Matthew Conlon); 2, Linda Buchanan’s Skypark Elite (Catherine Buchanan); 3, Denise Crawford’s Carrickadawson Womanizer (Erin Crawford); 4, Joanne Morton’s Tynnan Dominic Blue (Kathryn Morton); 5, Jessica McIntyre’s Gregory Courage (Simone Leathem).